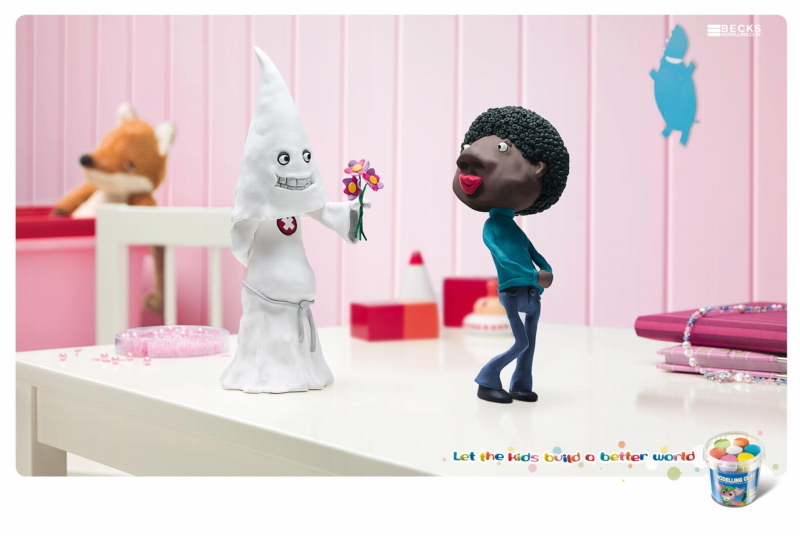 At left is a print piece called "Black is Beautyfull," in which a grinning clay Klansman offers a meager bouquet of flowers to a simpering black chick with a 'fro. In a variant, "Fun Religion," a Muslim and a Jew surrender to the call of John Travolta, circa 1977. We loved Play-Doh as kids, but remain unconvinced it's good for much of anything besides making lopsided balls. Have you ever tried building with Play-Doh? It's next to impossible. Left out for a few hours, it's totally ruined and you can never play with it again. For some reason though, even after it's dry and worthless it still manages to stink.